Purchase Rewards lets you earn rewards by using your UKRFCU Debit Card to purchase merchandise and services. Through this program, you’ll receive targeted offers to receive rewards on purchases based on how you shop. The more you use your UKRFCU Debit Card, the more offers you can receive and the more rewards you can earn! Easy – Click to activate exclusive cash back offers at the types of places you like to shop. Spend – Shop online or in stores to redeem your offers by paying with your card. Enjoy – Get cash back deposited right into your account the next month. Each offer is based on how you currently shop, so the offers that you receive are relevant! To redeem the offer, simply click on it to see the details; this automatically loads the offer onto your debit card. Then shop at the specified retailer and pay using your debit card to earn the reward. Each offer has different details regarding when and where to shop and how much you need to spend. Your rewards will typically be deposited to your account the next month after you use the offer. No Checking Account – No Problem – To utilize this program, you must have a UKRFCU Debit Card that is linked to your Share Draft (Checking account). 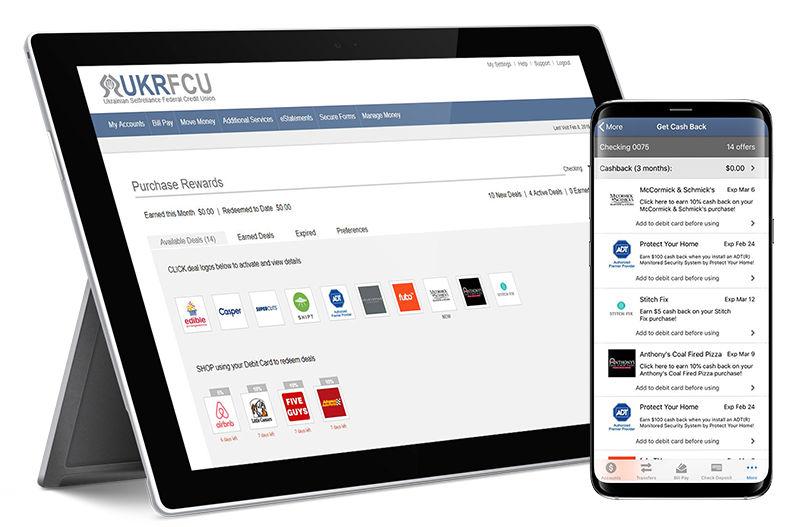 You can sign up for a Share Draft or order a debit card at any UKRFCU branch.